If the frame bent once, of course, it can bend again. Adding a section of 4"x4" steel tubing should strengthen the frame enough to keep it straight in the future. We wanted to avoid weakening the frame by welding on it so we decided to clamp the tubing to the frame. However, bolting the along the length of the tubing would not allow for travel of the wheels when raising and lowering. 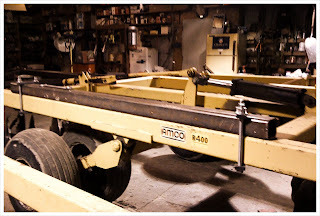 in the end we settled for clamping the tubing on the ends and welding in the center, above the axle. Fingers crossed.